My favorite type of forested areas for hunting most mushrooms has to be deciduous woods that, for the most part, have a larger proportion of various oak trees and beech than other types. In the summer, during the chanterelle growing season, which is usually from mid July to the end of August there are so many types of mushrooms showing themselves that you can be overwhelmed trying to identify them all. However, once you know a lot of different varieties from years of experience, you can by-pass a large percentage of them and concentrate on certain types. Concentration is key if seeking Horn of Plenty. 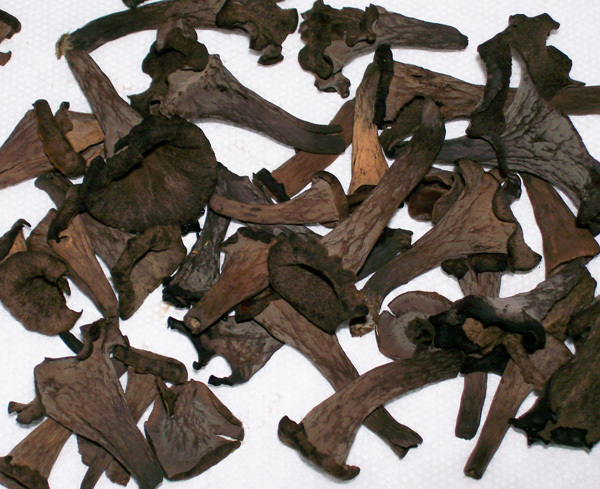 Many times, like their cousin Craterellus fallax ( Black Trumpets ), Horns of Plenty get to be almost black in color. They start tan, then brown then towards black. The bottoms have a smooth , dusty gray appearance. No gills on these either. They can be described as having a musical 'Horn-like' appearance when young and more flowery upon maturing. Check this group and look at the various shapes that they manifest. Once you find a patch make sure you never forget it. It grows every year in the same area - as long as the weather conditions cooperate. You can pick these every few days from July through September in our area of southwestern Pa. Here is another example of a group ready for picking. Click photo for another example. These are tough to find even when you are diligently looking. 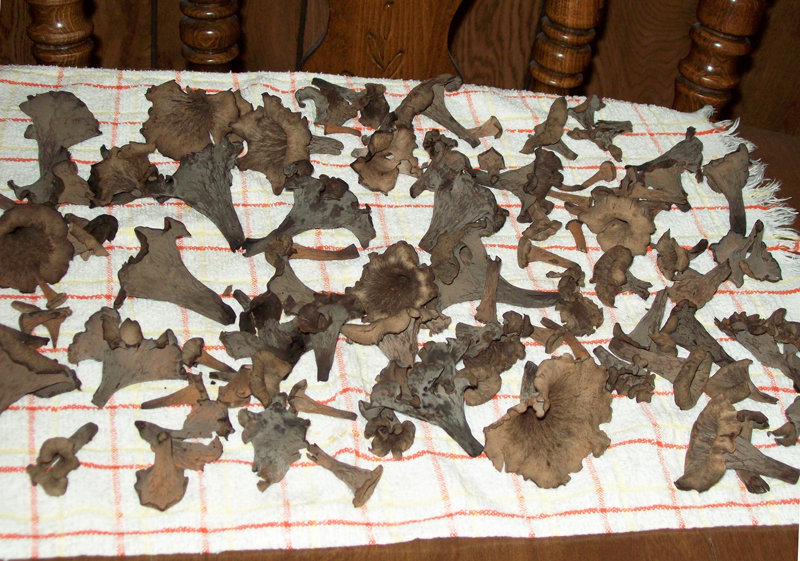 It's a lot like looking for black morels in early April. You look and look and look and all of a sudden you are surprisingly surrounded. They hide so well - mostly - unless they are in green moss as the photo immediately above depicts. Can you find the Horn of Plenty in the center of the photo below? Indeed, it has been suggested that when looking for these elusive fungi to look for holes in the ground - I am not lying. Of course there will be times that you will actually find holes in the ground. Don't pick those. Best practice when finding one? Squat down next to the one you found ( so as not to lose it ) and look around. In a few seconds your eyes will become accustomed to spotting them and soon after you will notice the others. You will say to yourself ' Wow, look at them all'. 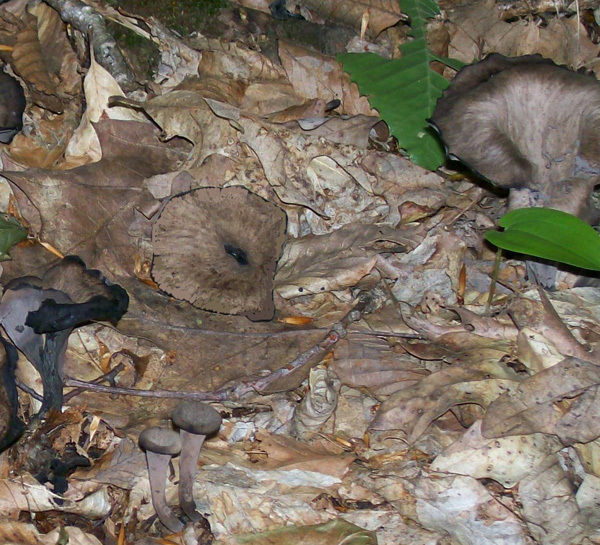 You will even look under your foot because you will not believe that you got in amongst them all without stepping on them - just like morel hunting. Horns of Plenty are common in Pennsylvania but you have to know where to look for these, that is, what habitat they grow in - again just like morels. You should look in mixed deciduous woods but preferably with more oak and beech trees in the mix. Mossy areas in those types of woods is also something to keep your eyes out for. Find a creek or spring seep in such woods and follow along it. Leaf litter is also a good place. 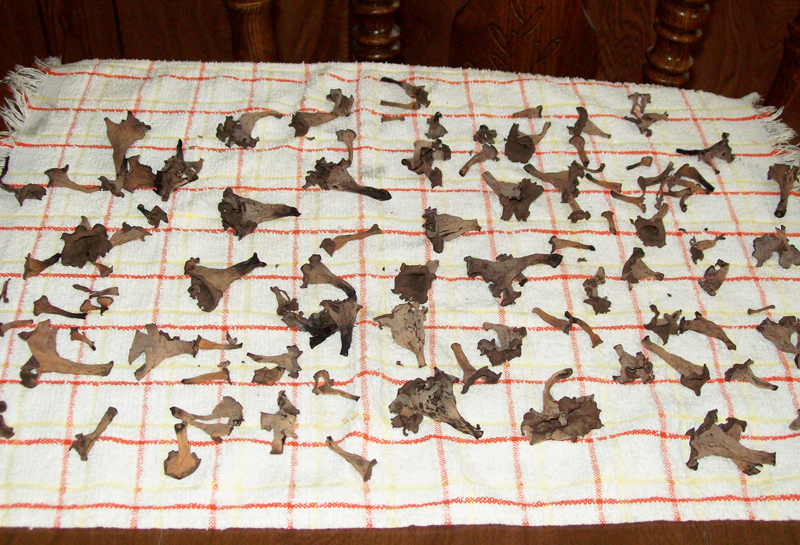 These chanterelles dry real good and lose nothing in flavor after having done so. On several occasions I dry them right on the dash of the truck. Spread them on a towel and go get some more. A couple of hours later they are ready. Put them in a jar or zip up plastic bag and keep in a dry / dark place. If you get a large quantity, like I do on occasion, spread them out on an old window screen, put another old window screen over it supported slightly above the bottom one and set outside in the shade. Let the air dry them for you. Or place them on a towel and let a fan blow over them for the night. The two photos above are 'Before' & 'After'. So, what do you do with these Horns of Plenty? You can treat them just like any other mushroom if you wish OR you can really stretch them by using them as a flavor enhancer. 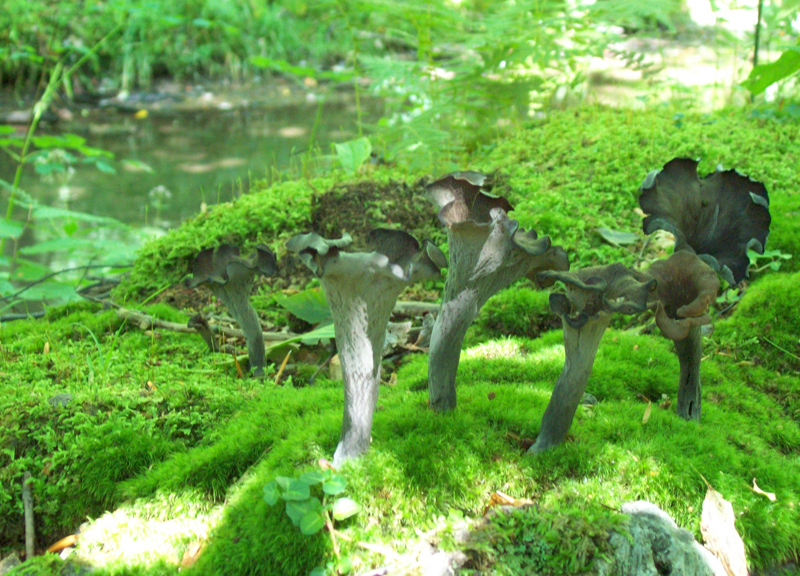 Treat these just the same as you do Black Trumpets. Sometimes these are also called ' Poor Man's Truffle ' because they have such a rich mushroom flavor and aroma, they are affordable ( us poor people can find them ) AND you don't need a trained Truffle pig or $10,000 Truffle hound to find them. If you have already dried them use them in other dishes by grinding them up over some of the food you are going eat. Grind some up and add to mushroom soup made with other mushrooms you have in greater abundance. Just a bit, like a slice of truffle, goes a long way toward that purpose. 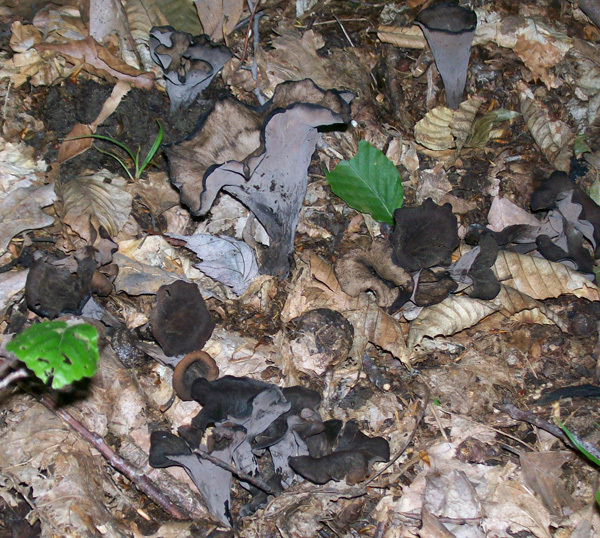 Craterellus cornucopioides - A/K/A - Horn of Plenty and sometimes Black Trumpets ( although that is more aptly applied to Craterellus fallax ). DATE - August 16 and 30, 2009. FOUND - 'Laurel Hill State Park, near Bakersville, Pa. - close to Laurel Hill Creek and another grouping at Jones Mill Run. 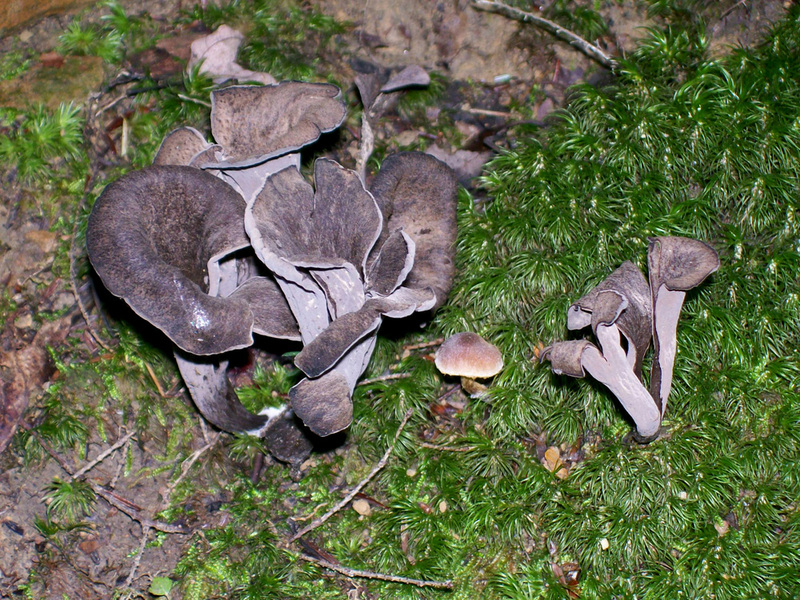 Growing in mossy areas and leaf litter of mixed oak and beech woods. 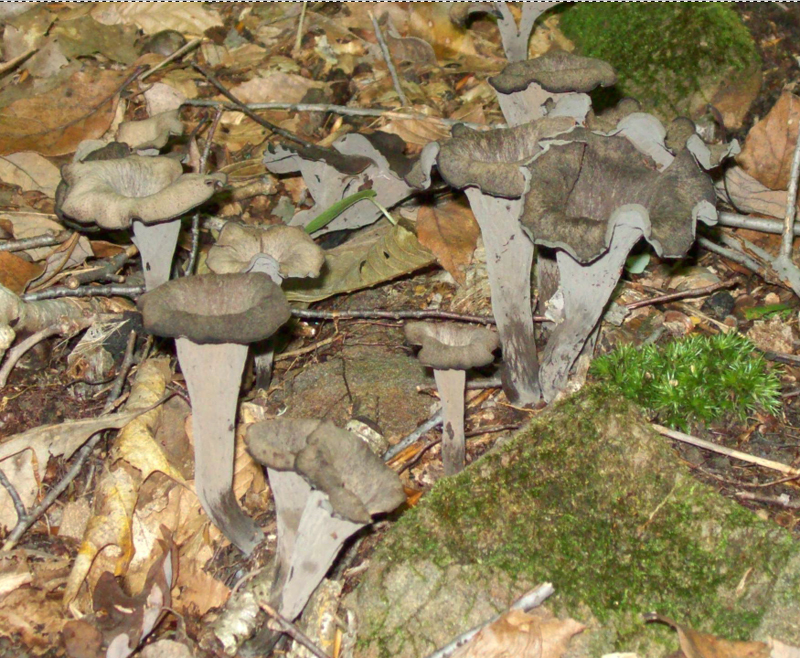 Weather conditions were dry for several days however these grow in an area that is usually damp, even in dry weather. Their proximity to the creeks, which is fog producing on hot nights, provide the necessary moisture throughout most of the day.